2007 Cashiers, N.C. Designer Show House — Patricia McLean Interiors, Inc. 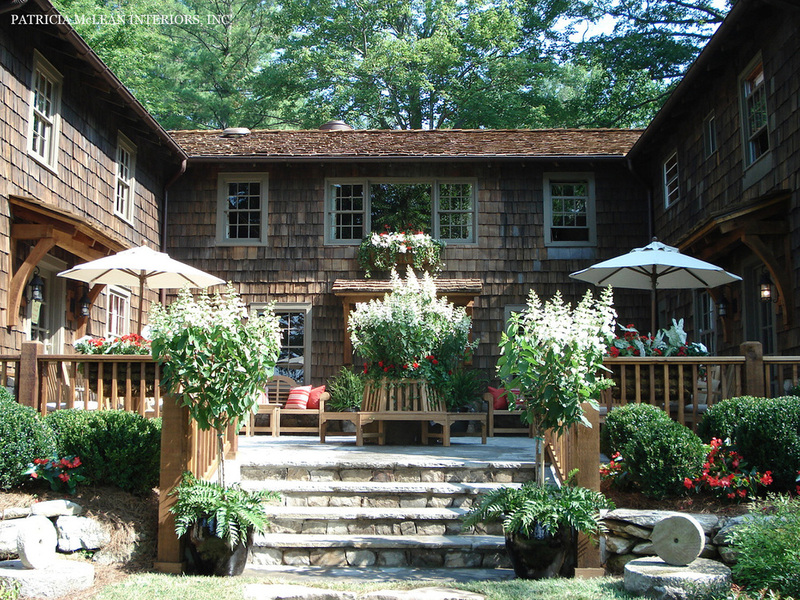 The Millstone Inn in Cashiers, North Carolina is the setting for this Show House. Overlooking Whiteside Mountain, this outdoor space is a delight for a designer. The slate porch was devoid of a center tree and thus a hexagonal tree bench has been incorporated. This custom-designed center piece, created by Scotlyn’s Yard Nursery in Cashiers, uses hydrangea trees. The teak tree bench, chairs, umbrellas and Luyten-style benches lend many eating and visiting perches. The red and white flower boxes are inspired by ones Patricia saw throughout London that same year. The biggest challenge was mounting the box over the door at the back where scaffold was required. The oversized garden seats and red and white pillows complete the scheme. The black planters for trees at the stairs welcome guests to the wonderful mountain air on the porch.